Are you looking for another market in which to expand, grow or start a new business? Thanks to cooperation with the CEE – British Business Centres and British Chambers associated with the Council of British Chambers of Commerce in Europe (COBCOE), we are able to link you and your business with more than 4000 companies in 35 countries in Europe. 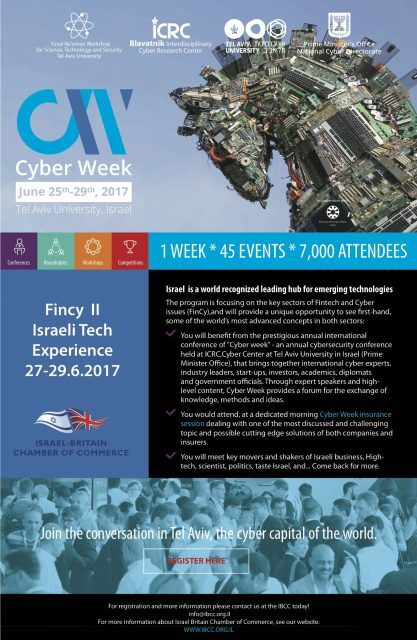 You will benefit from the prestigious annual international conference of “Cyber week” – an annual cybersecurity conference held at ICRC, Cyber Center at Tel Aviv University in Israel (Prime Minister Office), that brings together international cyber experts, industry leaders, start-ups, investors, academics, diplomats and government officials. Through expert speakers and high-level content, Cyber Week provides a forum for the exchange of knowledge, methods and ideas. You would attend, at a dedicated morning Cyber Week insurance session dealing with one of the most discussed and challenging topic and possible cutting edge solutions of both companies and insurers. You will meet key movers and shakers of Israeli business, High- tech, scientist, politics, taste Israel, and… Come back for more.